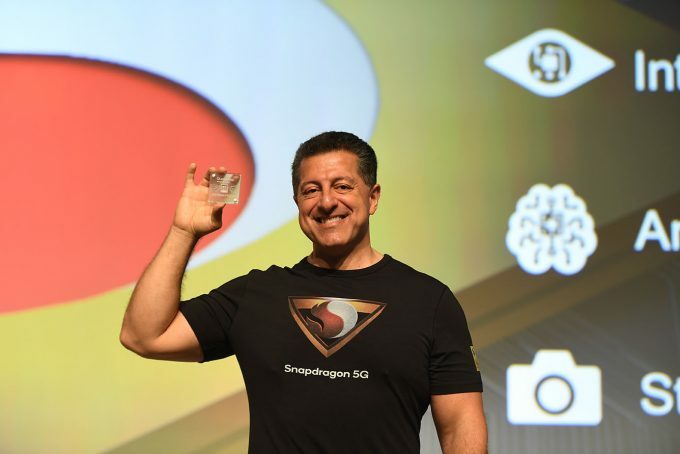 At its third-annual Snapdragon Tech Summit, Qualcomm detailed most of what we want to know about its upcoming Snapdragon 855 mobile platform. Get ready for improved CPU and GPU performance, greater gaming and media capabilities, next-gen artificial intelligence performance, new alluring camera features, and a lot more. Despite the rumors of the next Snapdragon being 8150, we saw Qualcomm use its Tech Summit in Maui this week to set the record straight: it’s actually Snapdragon 855. A mere version bump doesn’t mean a whole lot, but 855 will bring on some major changes and improvements. 5G is a major feature of the 855 mobile platform, but it’s certainly not the only intriguing one. Right off the bat, let’s get to some basics everyone is wondering about. With 855, Qualcomm says that the CPU performance is 45% improved, while the GPU is 20% improved. This sounds great on paper, but of course, we’ll need to run our own benchmarks at launch to gauge the real gains. Even a 20% boost to CPU would be appreciated – +45% sounds incredible. These improvements are not just about intensive tasks being handled easier, but system responsiveness and app load times will also greatly improve. Qualcomm says that its Snapdragon 855 ushers in a “new decade” of mobile advances. That’s because these “G” upgrades seem to span decades, and 5G is the next frontier. On paper, Qualcomm’s modem is capable of some huge performance, but it’s likely improvements in latency that most people are going to end up appreciating most. It’s great if a single file downloads fast, but it’s even better when webpages don’t take seconds to begin loading at all. The San Diego-based company says that its Snapdragon 855 leads the pack with support for both 5G mmWave and sub-6, reaching up to a claimed 5Gbps in speeds. That comes in addition to up to upgraded 2Gbps speeds over 4G LTE. At a time when most households crave a 1Gbps connection, these touted network specs are downright exciting. The 855 extends its wireless capabilities by claiming itself as the world’s first “Wi-Fi 6” solution, representing 802.11ax standards. If “Wi-Fi 6” makes no sense to you, then check out Jamie’s post on the subject of the consortium’s new branding right here. There’s also support for 10Gbps 60GHz 801.22ay, as well, in case the alternative face-melting 5Gbps connection feels too tame. You might not ordinarily think of your smartphone as being a gigabit device, but with Snapdragon 855, phones can support three different 1Gbps+ wireless technologies. How’s your data plan going to like this news? 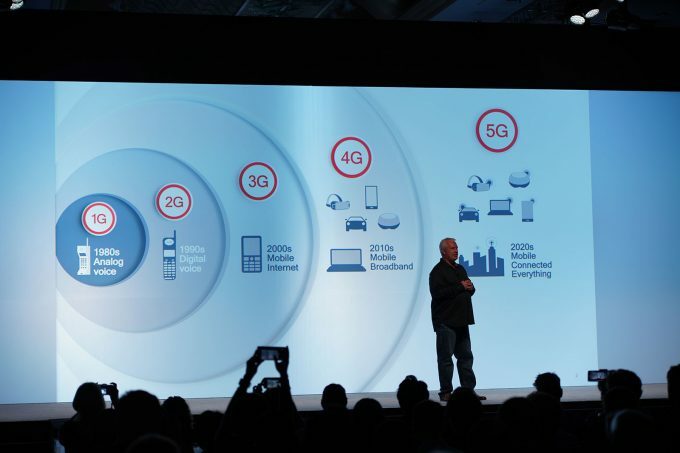 Thanks to the technical capabilities of 5G, it expands what we’ll be able to do with our mobile devices. Qualcomm has talked a lot about XR (eXtended Reality) over the past year, which is a bit of a merging of virtual and augmented reality technologies that its mobile devices will be suited to handle. Artificial intelligence is another major focus – improved performance means far better experiences. On the AI front, the Kyro CPU, Adreno GPU, and Hexagon DSP work together to allow Snapdragon 855 to heterogeneously tackle what’s overall a very computationally intensive type of processing. Artificial intelligence is already being used in countless ways to improve our digital lives, and its permeation will only continue to grow. With the Hexagon 690 DSP, Qualcomm has managed to improve the scalar performance by 20%, and vector performance by an impressive 100%. Bolstering the AI capabilities even more, Qualcomm has agreed with Google and NVIDIA that Tensors are useful for AI, and so a brand-new accelerator has been added to Hexagon. With OnePlus really popularizing under-screen finger print readers with its 6T, it’s a feature that we’re going to see more of in the year ahead. But before those cool sensors are even deployed on more than a handful of devices, Qualcomm is already talking about the next step: under-screen ultrasonic finger print sensors. This isn’t just more accurate, it’s more accurate because it uses 3D acoustics to better read prints through dust and oils – key ingredients to helping to solve the common complaint of failed readings. Mobile phones are hardly just mobile phones anymore. For many, they’re literally the only camera they use, so when improvements are announced on that front, it’s always intriguing to know what’s coming. 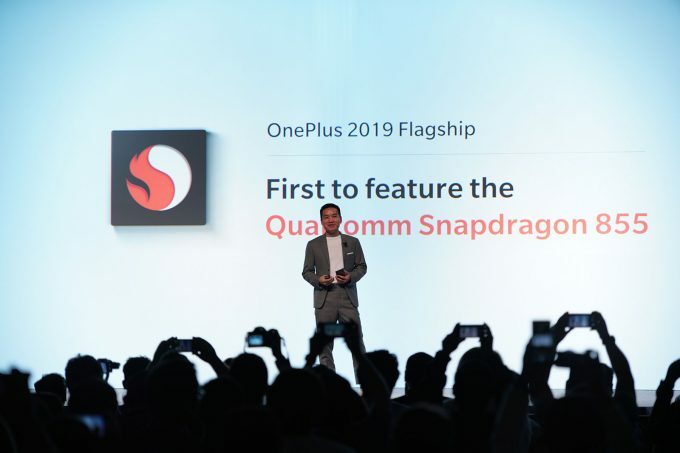 In Qualcomm’s case, Snapdragon 855 is going to be bolstering the capabilities of the camera in many ways. 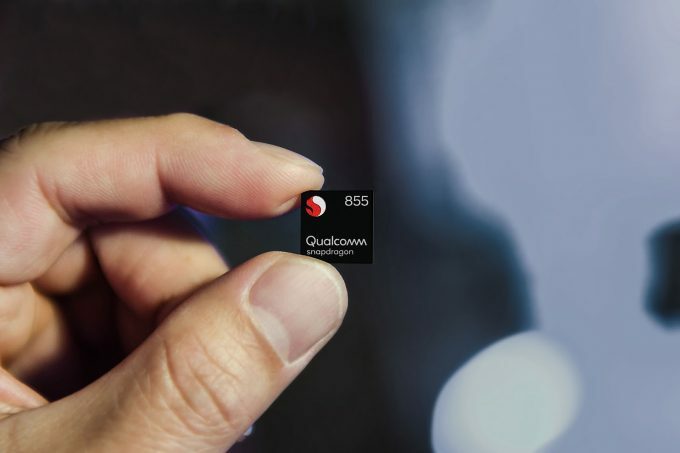 When the camera is launched on a modern Snapdragon devices, it calls upon Qualcomm’s Spectra ISP, which captures all of the important information on a scene to generate the image. The capture process then calls on the Hexagon DSP to analyze properties of a scene, figuring out the best way to present the image result we’re after. Both processors combine their efforts to deliver the final result. This is especially useful in creating the coveted bokeh effect, not just in photos, but also video, which can look seriously good when done right. In order to improve the capabilities of 855’s image-sensing capabilities, core components that were in some of the other processors – such as Adreno – were plucked from their silicon grasp, and placed inside the Spectra ISP instead. This wasn’t just done for performance’s sake, although that is a key benefit, but it was also done to save up to four times the power. As we live more and more on our mobile devices, any favor done towards battery-life is much appreciated. In more specific terms, Qualcomm says that it’s improved power savings with 6DOF body tracking by 2x, while object detection and tracking sit at an even more impressive 4x. With such great improvement, Qualcomm has given a name to this features family, called CV-ISP, or Computer Vision Integrated Spectra Processor for long. Beyond that, 4K video capture has also had its power consumption improved 3x, which sounds great considering devices can get quite warm after just a few minutes of capture (and hopefully this gets rid of the common 5 minute 4K/60 capture limit). 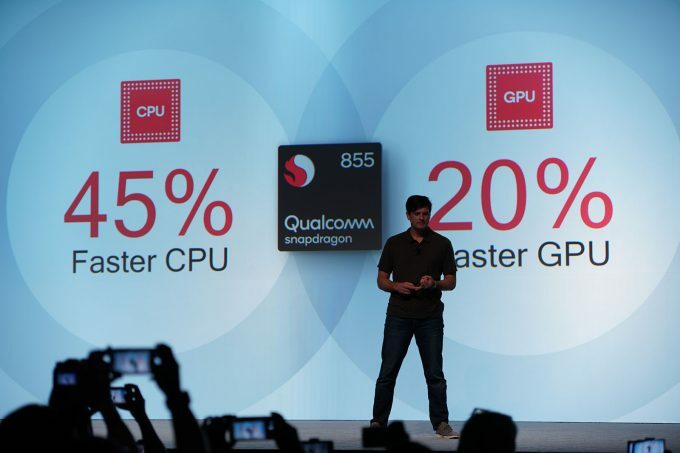 Note that these power reductions are being compared to Snapdragon “800”, not 845. 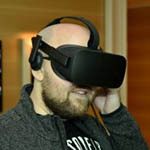 Performance is also boosted thanks to these changes, enabling Qualcomm to deliver computer vision perks like depth sensing at 60 FPS (which not a small task), six degrees of freedom XR body tracking, real-time object segmentation (eg: replace a background in either a photo or video), among others. Tying into this, it looks like JPEG’s days could be numbered. Qualcomm talked of a proper successor to the wildly popular file format, called HEIF, one that stores a lot more modern information inside of captured photos and video – such as HDR and computer vision properties. Snapdragon 855 is going to be the first hardware solution on the market with full support for HEIF. We’ve heard this kind of promise before, but one of HEIF’s claims to fame is that it can deliver the same image quality at half of the file size. That’s despite storing extra information that could prove useful later, even years down the road. A direct example of how this would be useful came from Qualcomm itself: you could take old photos of yourself, and then utilize the stored depth information to deliver an attractive bokeh effect, perfect for that dating profile. Another great feature of HEIF is the ability to store multiple files, and even videos, as a total package that you could give to someone – an especially great way to make someone jealous of a recent vacation. It also means that burst photography could store every single photo in the HEIF file, which sounds great vs having dozens of individual files scattered about. 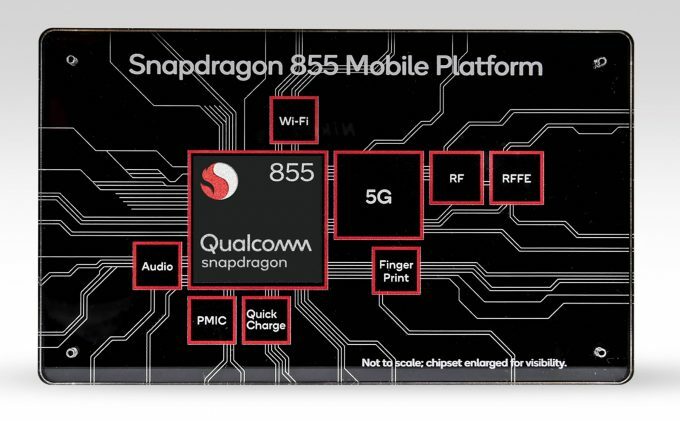 Media is obviously a big part of any Snapdragon launch, and as you can already tell, Snapdragon 855 is no exception. Also on tap is proper hardware acceleration for H.265 and VP9, a couple of codecs that are quickly becoming the de facto choices for optimized online video, covering services like Netflix, YouTube, Hulu, Twitch, and even social networks like Facebook, and Twitter. Power consumption is tied into all of that as well, as this series of improvements is said to be 7x more power efficient. That doesn’t mean you’re going to get 7x the battery-life, so we’ll have to wait for final hardware before seeing the true numbers. This is an area where Qualcomm continues to pile on more features. 855 will fully support HDR10+, 120 FPS video playback, and even 8K/360° video for VR use. These are respected features on the desktop, so to see them touted for mobile makes their forthcoming availability even more impressive. We’ve yet to talk about gaming yet, so let’s take care of that. During its Tech Summit, Qualcomm dropped some impressive information about money generated in the gaming market. If you thought consoles hogged a great chunk of the overall pie, you might be surprised to learn that mobile actually accounts for 51%, which represents a 25% gain year-over-year. That’s some truly ridiculous momentum (with China responsible for a large part), and is key to why Qualcomm is paying so much attention to it. 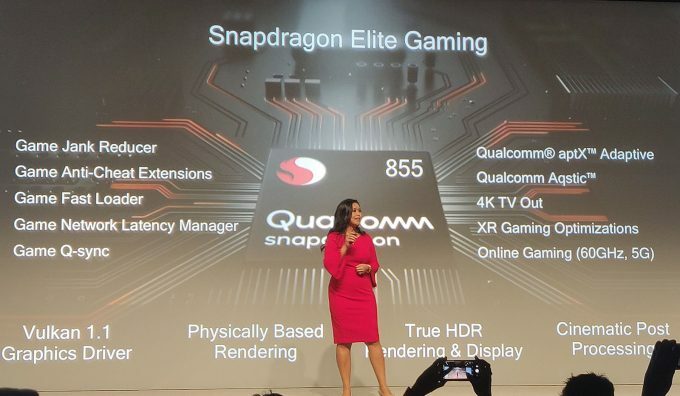 Gaming improvements with Snapdragon 855 have led to the new “Snapdragon Elite Gaming Experience”, fueled by the new Adreno 640 graphics processor. At the forefront, that encapsulates support for HDR, PBR rendering, Vulkan 1.1, and of course, improved performance. With physically-based rendering (PBR), games could utilize ray tracing to vastly improve the lighting in a game’s scene. Clearly, physically-based rendering is a bleeding-edge feature for mobile, and really, it is for desktop, too. NVIDIA only just released its RTX series to accelerate ray traced workloads, and as we’ve seen, it’s extremely computationally intensive. Qualcomm exudes confidence that we’ll see this as a real feature in games in the not-so-distant future. The mega popular Unity engine will fully support it, hopefully encouraging game developers to waste no time investigating the feature. So, this all leads to an ultimate question: when will we see the first Snapdragon 855 devices? Well, it’s not written in stone yet, but we do know that crowd favorite OnePlus will be one of the first out the door with a device, although it seems extremely likely that other vendors will follow suit soon after.